Who doesn’t love a big trade show? They require energy, powerful photography tools and a keen eye for understanding what marketers of trade shows are looking for both on the day(s) of the event as well as future promotion. 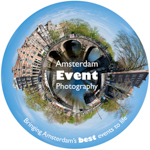 We love them all and, in 2017, the Founder of Amsterdam Event Photography – Benjie Arthur – became an approved photographer for the RAI Amsterdam. No matter what your needs for your next trade show are, we’d love to hear from you. Additionally, we capture trade show booths on assignment.